The investor selects a USCIS approved regional center and a specific investment project sponsored by that regional center. A confidential private placement memorandum and related offering materials are provided by the regional center to the interested investor. The interested investor should review carefully the confidential private placement memorandum and related offering documents and ascertain the suitability of the project, the associated risks and the overall investment opportunity. Once an investor decides to proceed with a specific EB-5 project sponsored by the regional center, the investor must complete and execute all subscription and escrow documents and make the required capital investment amount of US$500,000 or US$1,000,000, depending on the location of the investment project. The investor will need to work with an immigration attorney to submit to USCIS an I-526 petition. An important element of the I-526 petition is the requirement for the investor to prove the lawful source of the funds used to make the investment. This petition requests USCIS to approve the EB-5 applicant for conditional permanent residency. In evaluating the I-526 petition, the USCIS typically focuses on the project as well as the individual investor. At the project level, USCIS’ main interest is whether, based on the business plan and other information contained in the I-526 petition, the project is likely to create the number of jobs required. At the individual investor level, USCIS will focus on whether the investor’s funds were obtained from a lawful source, and whether the investor’s funds will be placed “at risk”. Upon completion of this step, the investor will receive a “conditional” Green Card valid for two years. As a conditional Green Card holder, the investor will have the same rights, benefits and duties of a regular Green Card holder. This means the investor’s children can go to school in the United States and the investor and his or her spouse can legally work as well. 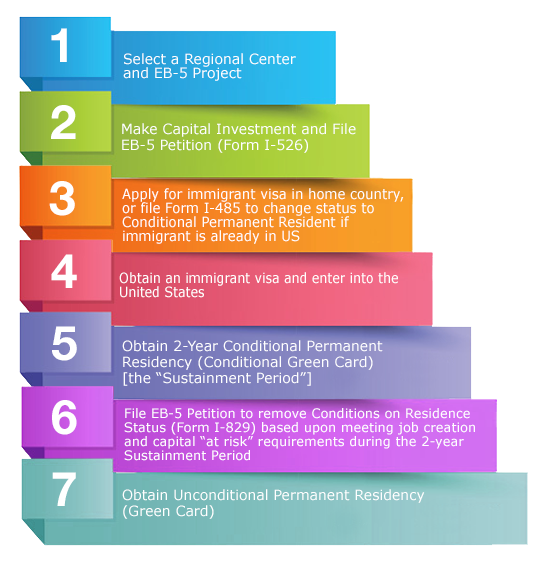 During the period between 21 months and 24 months after the EB-5 applicant’s admission to the United States as a conditional permanent resident, the applicant must submit a Form I-829 petition to USCIS to remove the visa conditions. In reviewing the I-829 petition, the USCIS will once again review both the project and the investor’s compliance. At the project level, the USCIS will expect a confirmation that the required number of jobs has been generated. This involves verification that the commitments made in the business plan have been met, particularly the actual expenditure of project funds. At the investor level, USCIS will require confirmation that the investor has sustained his or her investment in the project and that the investment remains to be “at risk” (meaning there is no guaranteed return on the investment or guaranteed repayment of the investment). Once USCIS approves this I-829 petition, the conditions will be removed from the lawful permanent resident status of the investor and any included dependents and Green Cards will be issued to them. The investor and the dependents can permanently live and work in the United States and have an option to apply for citizenship after 5 years of being a permanent resident.